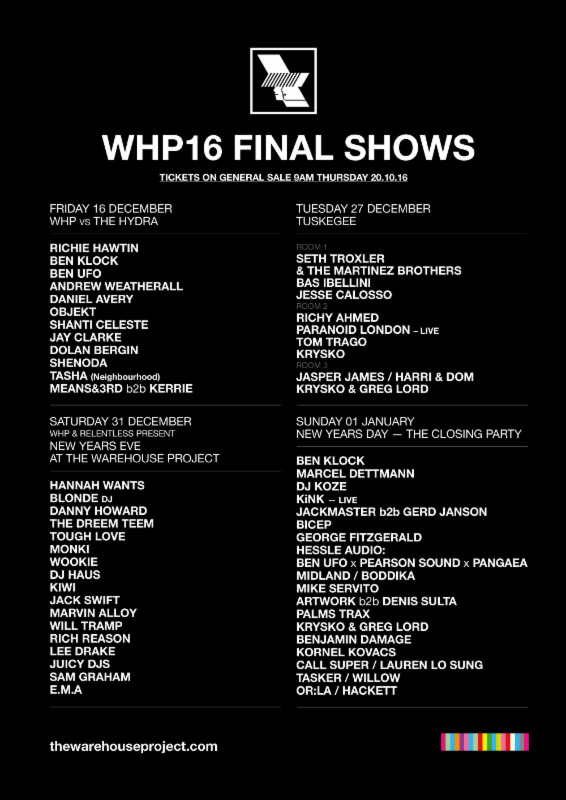 Warehouse Project has revealed details of its final four parties of the 2016 season, which are set to take place on Friday 16th and Tuesday 27th December, as well as New Year’s Eve and New Year’s Day. Tickets go on sale this Thursday 20th October at 9am. The Hydra hits Manchester’s Store Street warehouse on Friday 16th December, with Richie Hawtin, Ben Klock, Ben UFO, Andrew Weatherall, Daniel Avery and many more all locked in to spin on the night. Tuesday 27th December brings a Tuskegee showcase, with head honchos Seth Troxler and The Martinez Brothers going b2b, alongside sets from Bas Ibellini, Jesse Calosso, Richy Ahmed, Paranoid London live and many more. Hannah Wants hits Warehouse Project for New Year’s Eve, and the Birmingham-based selector is joined by Blonde, Danny Howard, The Dreem Team, Tough Love, Monki, Wookie, DJ Haus, Kiwi and lots more. A massive line-up wraps up the 2016 season on New Year’s Day, with Ben Klock, Marcel Dettmann, DJ Koze, KiNK live, Jackmaster b2b Gerd Jansen, Bicep, Midland, Palms Trax and Kornel Kovacs all on a stacked bill. You can see the full line-up for the final four parties of Warehouse Project 2016 below, and buy tickets through the venue’s website from 9am on Thursday 20th October.